These Premium Prismatic Checks are fully compatible with ADP Workforce Now and come with multiple security features to help prevent fraudulent duplication of your checks. Your choice of 1 or 2 signature lines (with or without signature line titles), MICR encoding and consecutive numbering in 2 positions in black ink as shown. Printed on 24 lb. Tamper-Resistant Check-Protect Paper. Product Type Preprinted in black only, unless specifically requested (additional charges will apply). At FormCenter, we are very concerned about check fraud. easier than ever. Fraudulent checks cost American companies millions of dollars a year in stolen funds. 1. 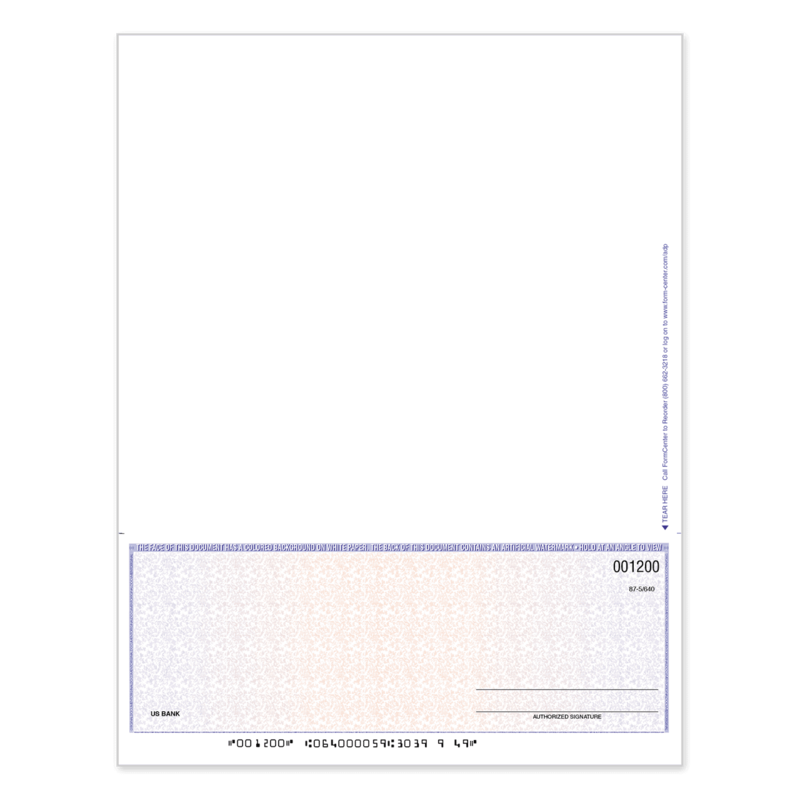 Warning Band - Indicates that the face of your check has a colored background and an artificial watermark on the back. 3. “Void” Pantograph - The word “VOID” will appear in the background of a photocopy of your check. 4. 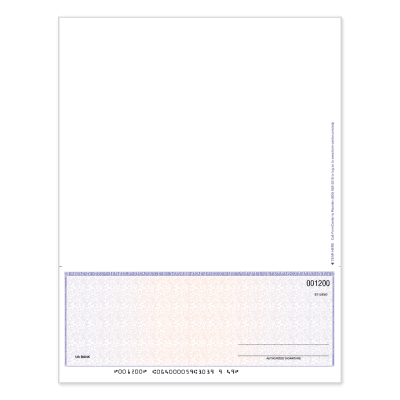 Microprinting - The bottom border of the check is made up of the words “ORIGINAL DOCUMENT,” which can only be read with a magnifying glass, and which run across the entire bottom of the check. NOTE: All checks are printed on chemically-reactive tamper-resistant check paper. 1. Artificial Watermark - A crisscross pattern reading “PROTECTED DOCUMENT” (not shown). 2. Thermochromic Printing - The red “Padlock” logo on the back of the check is printed with a heat- sensitive ink that reacts to your body’s warmth. The logo fades when it is warmed by your finger or breath and reappears when the check returns to room temperature. 3. Micro Printing - The line below the words “DO NOT WRITE/SIGN/STAMP BELOW THIS LINE” is made up of the word “FORMCENTER,” which can only be read with a magnifying glass.